Celebrate Chinese New Year on 22 January with this quick supper dish using Amoy noodles and stir-fry sauce. Just add beef, pork, poultry or shellfish and fresh ready-prepared stir-fry vegetables. And for a starter, why not serve Waitrose 8 Prawn Toasts. See Winter Seasons for more ways to make the new year special. Heat 2 tablespoons of oil in a large wok or non-stick frying pan. Add the ginger and garlic and stir-fry over a medium heat for 1-2 minutes or until just beginning to colour (do not allow them to brown too much). Add the noodles and toss together for 1 minute, tip in the vegetables and stir-fry for 2-3 minutes until they are wilted, but still crunchy. Divide between four plates or bowls and keep warm. Heat the remaining oil in the wok. Add the steak pieces and salad onions and stir-fry over a high heat for 1-2 minutes or until the meat is well browned and cooked to your liking. Reduce the heat. Pour the black bean sauce over the top and add 5 tablespoons of cold water. Toss together for 1 minute until the beef is well coated and the sauce is hot. 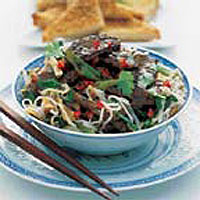 Spoon over the vegetables and noodles and serve immediately, garnished with coriander leaves and chopped red chilli. A good stir-fry needs to be cooked quickly over a very high heat. Have your ingredients all ready prepared and the serving dishes warming before you start to cook.